“This technology is the new wave of aviation; anything that a manned aircraft can do, an unmanned aircraft could do for less money.” – Patrick Eagan, unmanned aviation consultant and editor of Small Unmanned Aircraft Systems News. The awe-inspiring Boston Marathon had more eyes on it this year, and not just the ones you’d expect. Unmanned Aerial Vehicles (UAVs) or drones patrolled the marathon route from the starting line in Hopkinton to monitor for suspicious activity and threats to the 30,000 runners and one million spectators. They were equipped with advanced technology to enhance security and keep attendees safe. Drones may have a tainted reputation for their use as military weapons, but units designed for city services are becoming increasingly popular. Police departments are utilizing them to help patrol large events, like the Boston Marathon, and search for fugitives, criminals, and missing persons. Shelby County Police Officers estimate the cost to run a drone averages less than $3.80 per hour, compared with a helicopter that can run $600 an hour. Using a drone to expand the search for a missing person can be much faster to initiate. Searching terrains like dense forests can be difficult on foot and in a helicopter, but drones make it easier and more efficient to search these areas. 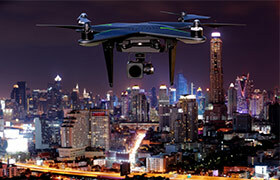 In smart cities drones are being used to inspect buildings and infrastructure. Construction, dams, walls, or sewer systems can become unstable, but a city might not know without a formal inspection. These examinations usually involve inspectors putting themselves in harm’s way to find cracks and faults that would make the infrastructure unsafe. In Los Angeles, sending workers into the water and sewer pipes can actually harm the infrastructure more, because the pipes have not been designed for walking on. Drones relieve the inspectors of dangerous situations and don’t further damage the infrastructure. The drones are manually operated or programmed to record video of the entire structure for analysis during or after the fly-through. Self-driving and energy efficient vehicles are bringing convenience and energy-efficiency to city streets. Two problems self-driving cars have not yet completely resolved are avoiding traffic and quickly finding parking. To address this, smart vehicles could communicate with parking dronesto find empty spaces. This would cut down on street traffic, save time, and relieve the city of installing expensive sensors beneath parking lot asphalt. Federal agencies are taking tips from cities and the military to utilize drones in their work spaces. For example, the Coast Guard, Drug Enforcement Agency, and Customs and Border Protection all operate drones for work purposes. The Coast Guard uses them in search and rescue missions for finding missing or compromised vessels at sea. The Drug Enforcement Agency employs drones to search fields for illegal Marijuana crops and to surveil suspected drug houses. Customs and Border Protection keeps an eye on our borders, such as between the United States and Mexico border, with drones for illegal transport and entry to the country. Even though drone usage by cities, federal agencies, hobbyists, and the military is growing, they are not always secure. Hackers could compromise a drone to collect private or classified data, or take control and use them for unintended purposes. Cities must protect themselves and ensure their drones are secure and safe. The first important step in securing devices like drones is to make sure the network is secure.